Tom has 21 years of experience in the field of physical therapy. He started PT Link physical therapy as a single clinic in 2011. Since that time, PT Link has grown into the premier private physical therapy company in northwest Ohio, with clinics in multiple states. Tom Received his Bachelors degree in community Health and Wellness with an emphasis in psychology from the University of Findlay. He went on to receive his Masters degree in physical therapy also from the University of Findlay 2 years later while working full time. 3 years after receiving his Masters degree, while continuing to work full time as a physical therapist, Tom received a Doctorate of physical therapy from Temple University in Philadelphia. Temple was ranked the number 1 physical therapy program at that time. Tom has dedicated his career to learning the most research driven and outcome proven methods in physical therapy. 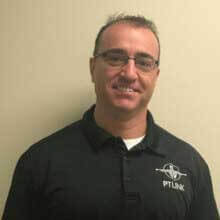 He has attained advanced certifications in mechanical diagnosis and therapy through the McKenzie Institute, advanced manipulation certification through physion, High velocity low amplitude thrust manipulation certification, biomechanical dry needling certification, Integrative dry needling certification, kinesio taping certification, and certification in functional movement systems. Tom is currently working towards advanced certification in several new areas as well as part of his quest to be a life long learner, and provide the best therapy possible to his patient population. Tom took what he learned through all the advanced study and created the Multi-System Approach to physical therapy. This approach is used throughout PT Link. This approach looks at how many systems of the body contribute to an injury or disease. The system then utilizes multiple approaches to therapy to address these different system as both the primary and secondary contributors of the patient problem. In doing this, the patient receives more comprehensive treatment and achieves better outcomes. This system can be applied to almost any condition new or old. Many patients have achieved progress that they did not think was possible even if they had tried other physical therapy in the past. Tom is married to his wife Kim and has 2 sons, TJ and Zack. Tom is a ravenous basketball fan having played college basketball himself, and currently coaches both of his sons in AAU basketball teams. Tom and his wife Kim enjoy staying active and do many races together throughout the year. These can include anything from 5k, to half marathons, to full marathons, to obstacle races. Tom has even finished a full Ironman race.